Halloween has come to break the spell! The starter of the last part of Amazing Halloween in 2014 is this popular unit. The neat and clean costumes with their grace and authority posing are so lovable. They look really cute in own wig. I think it's their new frontier of Halloween dressing. "Mrs. Pot, Lumiere, Cogsworth" from "Beauty and the Beast". I really love their Aladdin unit without the title role. Look at the each expression and eye-grabbing costume. I love their coloring sense. They always choose the beautiful color of material based on the animation film. Did you notice that? At the end of Jasmine's hair is curling exactly same as the movie. It's a tiny difference of others, but I think it's big effect on the photo. It's my one favorite point. very attractive and outstanding. "Prince Achmed, Jasmine, Razoul" from "Aladdin". Here a Here are another shots. In this photos, please enjoy the details of their wonderful props and costumes. On the right picture, Razoul have a bouquet by Jasmine from the very last scene of "Aladdin and the King of Thieves". The back of Prince Acmed. Yes they entertained that scene with cute Rajah bag! The another bag of them are also wonderful. The cool horse of Prince Acmed was appliqued on the bag beautifully and lively. The Razoul's sword has a hidden Mickey. They use a bench so cleverly which is obstacle for guests who dressed for Halloween. What a great idea and perfect for the climax scene! They are always different from other unit, but never go in the wrong way. They always decide to go classic and I really admire it. They are so beautiful in all aspects. I like Scuttle's edge of the surf. The other props of them are also amazing in every detail. The cute wedding cake topper bag, and hidden Mickey from the "snarfblatt" and the "kitchen knife". "Scuttle, Ariel, Chef Louis" from "The Little Mermaid". TDL Guests hail to the pumpkin song! Pretty two lady dressed as the character from "The Nightmare Before Christmas". I was attractived to their character combination. It was nice to greet Jack before and after firing at one time. "Jack Slellington & Pumpkin King" from "The Nightmare before Christmas"
Their costumes made very beautifully. My favorites are gorgeous ruffle sleeves of cute bird girl and the lovely shoes of beautiful bandit. I love their really happy face, so I think they played character after renewal of "Sindbad's Seven Voyages". "Hatched Roc Bird, Thief" from "Sindbad's Storybook Voyages". The pretty two enchanted me by their incredible costumes. Their marvelous well made dresses express a wonderful opening scene. Their bag design is a stage curtain at Show Base in Tommorowland. It's so nice! I'd like to buy it. "Mickey & Minniew" from "One Man's Dream II -The Magic Lives On-". I Am On My Way, I Can Go The TDL Halloween! I'm very surprised I never expected that I met this two Hercules characters. It's my first time to see Phil & Young Hercules. These two pretty girls did an excellent job. "Philoctetes, Young Hercules" from "Hercules". Do you see two prince and Briar Rose? Yes, he's absolutely prince, but he's a collectivity of forest friends. What a wonderful idea! I really impressed their sweetness and cleverness. Did you find every animals? The owl dresses the cape, a babbit eacch take the shoes, and chipmunk wears a hat! "A Forest Prince, Briar Rose, Prince Phillip" from "Sleeping Beauty". Fishy, Wake up! It's Halloween! She's too cute to be a girl who is bratty. Her costume are perfect and she also wore a long dental braces. Nemo in the plastic bag is very effective props to the character. "Darla Sherman" from "Finding Nemo". Thank you very much to all great Disney geeks. See you next TDL Halloween! 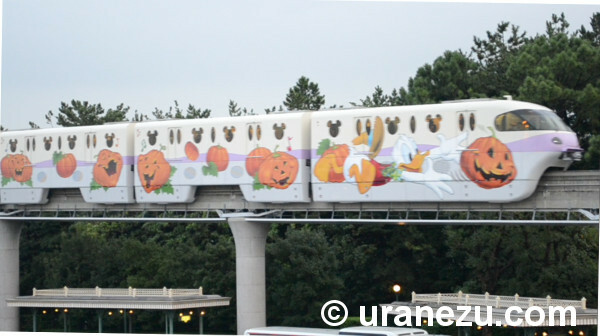 This part is not important because its my personal opinion in 2014 TDL Halloween. So let's wrap up the last segment. 2014 TDL Halloween was summed up in the statement that "Bench". Before I talk about this bothersome things, I have to introduce you a show in TDL. It's "Once Upon A Time" the first castle projection mapping show at TDL which has started in May. An inside the hub the best viewing area of the show is alloted by a lottery. We can't watch it standing freely from there like at WDW. These plastic bench on the above picture is all for the lottery winnter of the night entertainment. So let's go back about TDL Halloween, in every year, the guests dressed up for Halloween and people who wanted to see them come to the in front of the Cinderella Castle. However these tons of benches never go away in this event. Look at the above picture. There are some main roads existed, but most passway between the benches were very narrow. How many princesses with an elegant hoop skirt dressess got out from under the bad situation for Halloween. I think there were something dangerous had happned at the site. Guessingly, they'd like to disperse the Halloween guest from the hub. I think they left a bench as a obstacle intended for the dressing guests. Unfortunately the benches not a big effect upon the cheerly guests. Therefore, they came into another operation in the second half round. I took the above picture about 3 p.m. They kept the guests out from in front of the castle to set the bench for a first show 5:40p.m. I didn't know when they started to put the bench exactly, but it might started 2 p.m. or so. During the best time for a photo shooitng, the dressing up guests sheeply waited the reopeing. I seemed they dislike the Halloween dressing guest. Complicated and strict rules for the dress, and some baseless accusation, and this castle lookout. Through these harsh situation, still most good guests came to TDL Halloween, and enjoyed (of course they made a cntribution for a sales profit!). But in this year I saw some non-compliant guests (most surprising one was bloody stained sailor-style school uniform!) with impunity in TDL. Why do they tend to think creepy the guest who adherence to TDL Halloween rules instead of welcher. I hope they will find and look at another aspects of these good guests in next Halloween. "If only they'd look closer. Would they see a poor boy? No siree they'd find out there's so much more to me"- Aladdin. "I am on my way - I can go the distance. I don't care how far - Somehow I'll be strong. I know every mile will be worth my while. I would go most anywhere to find where I belong" ? Hercules.